The school is moving to a new building and the letters will not be used on the new building. The new building will be shared with another school and several other organisations, and the complex has it’s own name, ”De Bockesprong” . One of the teachers came up with the idea to take the letters off the wall on the day of the official movement. Not only for the teachers and the students, but also for the whole neighbourhood the letters have an emotional value, and more than once people told me how beautiful they found the lettering. The fact that they had to be removed was not welcomed by everybody. When it was checked how the letters where attached to the wall, it became clear that they could not easily be taken off on the morning of the movement. So the plan changed: the letters where taken off before and replaced by cardboard imitations. The original letters where very heavy, and taking them off with two-hundred and fifty children standing beneath watching, seemed a bad idea. So, last week I helped taking the letters off the wall. And after that I promised to make the cardboard letters. 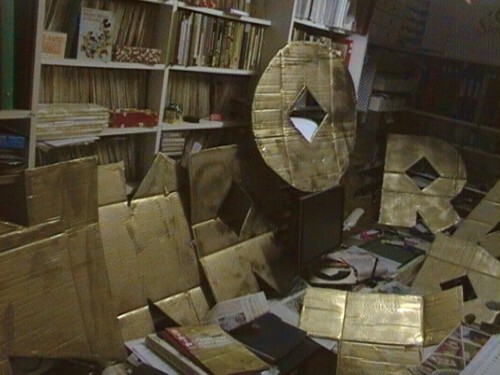 The height of the letters is 50 centimetres, so if I made them out of gold coloured cardboard, the project would cost about 75 euro’s. 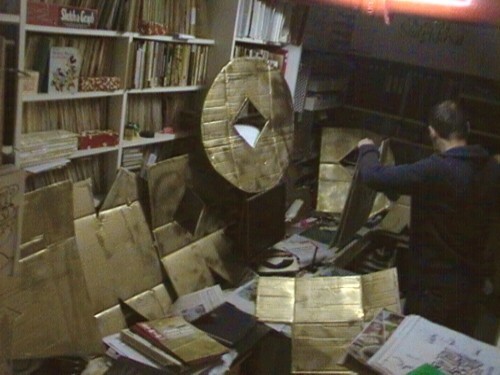 If I made them out of cardboard boxes that I could get for free at the supermarket and paint hem gold, it would only cost 15 euro’s. It would be a few hours extra work, but I had not much to do anyway, and I like to work with cheap materials. Making the imitation cardboard letters took me more time than I expected, but it was fun doing. I am very happy to have such a huge working space! When I asked what will be done with the original letters, nobody knew. I am afraid they will be never be used again.